It started like this: “we” put together an eight item shopping list of essentials that would get me in and out of Kroger quickly. Sprinkled on top of some vanilla ice cream? I make a salt blend with a smokey tea, lapsang souchong. The recipe where I came across the salt called for using it to season steamed edamame. I’ve since used it on other vegetables and in soups. Flavored salts can be a nice surprise. I was taken aback how delicious celery salt was sprinkled over a mild white cheese when it was served as a bar snack. Start with a sniff, then a taste. Begin seasoning something mild: eggs, cottage cheese, fresh vegetables. That will give you a better idea of how it plays with other flavors! I once had a conversation with a chef who ran the kitchen of a very big meditation retreat center. The place served many varieties of tea and often had gallons of the stuff left over. He used the brewed teas like water - to make rice, cook beans, for soup…This random conversation led the way for a lot of tea exploration on my part! Have fun! I say you make a matcha latte and add a tiny sprinkle on top! Topping pressed into shortbread cookies. My sister made a homemade batch of matcha salt and used it that way. I bet it would be interesting sprinkled on tropical fruits. Honestly, it jumped off the shelf at me. And it was marked $1.59. 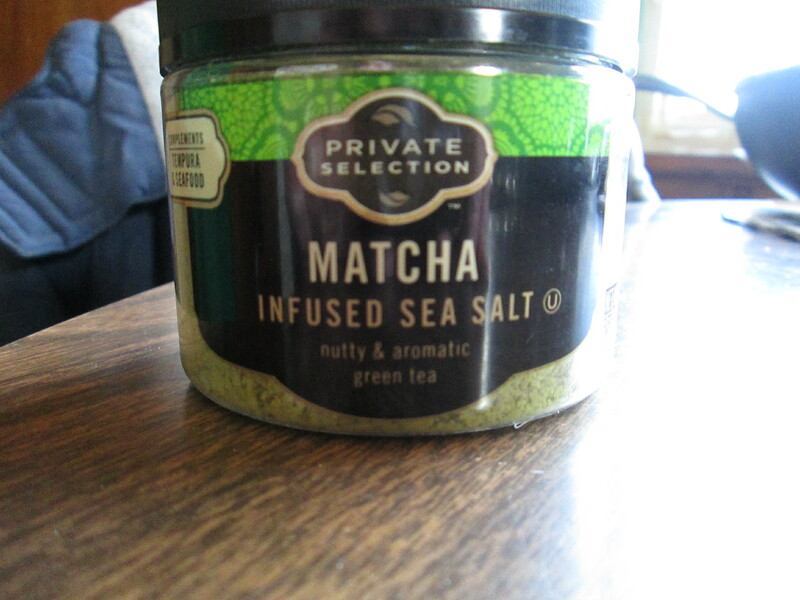 Curious, as matcha isn’t very cheap. The jar looks big. By the way, I know what © means what does u in a circle means? what does u in a circle means? Pretty sure means Kosher products? Except now I want to know what Spoiled Brat alter ego ended up adding to Mr. Nice Guy’s cart. I don’t know why but when I read that title the first thing that came to mind is the endurance show; “Naked and Afraid”. That looks like a great concept for the next big hit. I could watch someone rubbing two ham bones together to try and start a fire using doritos as the tinder. The jar is 6.52 oz, or 185 grams. The sticker on the jar said it was a closeout price so I guess this Kroger stocked it, but wasn’t satisfied with it’s sales so is discontinuing it. Although I have heard stories about people trapping in the interior of the meat cold section, unable to open the door. Not funny at all. Can be an episode of top chef. Also, some supermarkets at night, there are rats and roaches coming out. Well, let’s see: there’s a preciously small block of Kerrygold Irish Cheddar, a Family Sized bag of Better Made Rainbow Potato Chips, a four pack of Chocolate Chip Muffins, a box of weird Cheez-Its (Bacon & Cheddar DUOZ)…I just shouldn’t go on from here. Beside seafood and fish. Looks like it’s an interesting meat rub. Was this the side effect of shopping while hungry?